I am week four into my kitchen remodel. What does that mean? That I've been without a kitchen for nearly a month now. How am I surviving? Lotttsss of takeout (me and my waitress at my local Thai restaurant are like best buds now) and eating out. Paper plates and plastic forks for salads, sandwiches and tons of stuff from the grill. Without a stove or cooktop at our disposal, Erlend and I have been grilling like crazy! At first it sounded really epic, paleo and primal — cooking our meat and vegetables over an open-flame, just like our ancestors — ROAR! But now, if I'm perfectly honest with you guys, the next time I see a vegetable or some meat whose outer edges have been charred by the grill (as modeled by my friend Noah), I might just hurl it against the wall... because believe me, that charcoal aftertaste loses its appeal fast when you eat it every night. 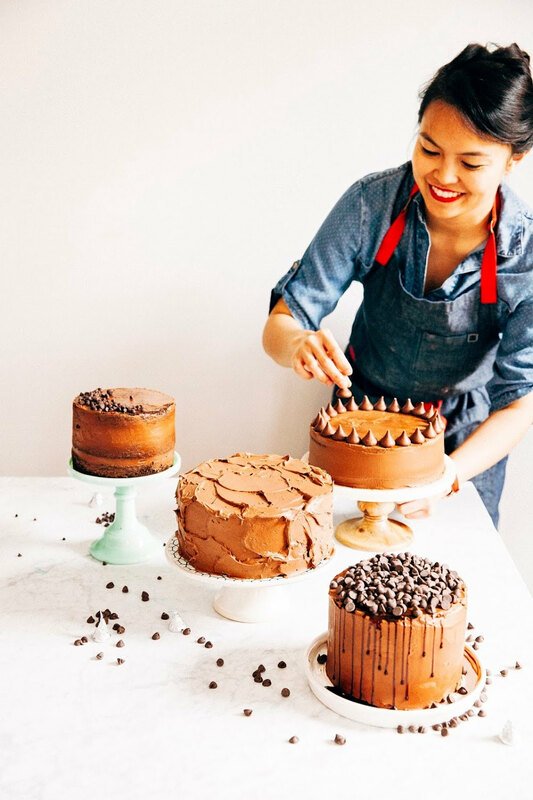 To prepare for the remodel, I spent the entire month of June frantically baking up a storm to have some blog posts to last me through the kitchen-less weeks. I was like some kind of tornado, baking every night and hastily snapping pictures before moving on to the next recipe. Unfortunately, my carelessness shows — flipping through my camera, I'm disappointed by the quality of my work. In the pictures, you can actually see that I literally just plopped down the dish, took a picture, and moved on with my life. So now I'm torn: is it okay to publish a great recipe with bad photos, or just omit it from the queue completely? I'm a big fan of throwing fruit into baked bar recipes (ehem, these blondies and these cheesecake bars). Brownies are one of my favorite baked goods, and I couldn't resist throwing in a handful of fresh blueberries to one of my standby brownie recipes and seeing what would happen. It took a couple of times to get the brownies right — at first the extra moisture from the blueberries wouldn't let the brownies set, but after a few tweaks like dredging the fruit in flour (see baker's notes) and increasing my original brownie recipe's baking time and temperature, they came out perfectly. 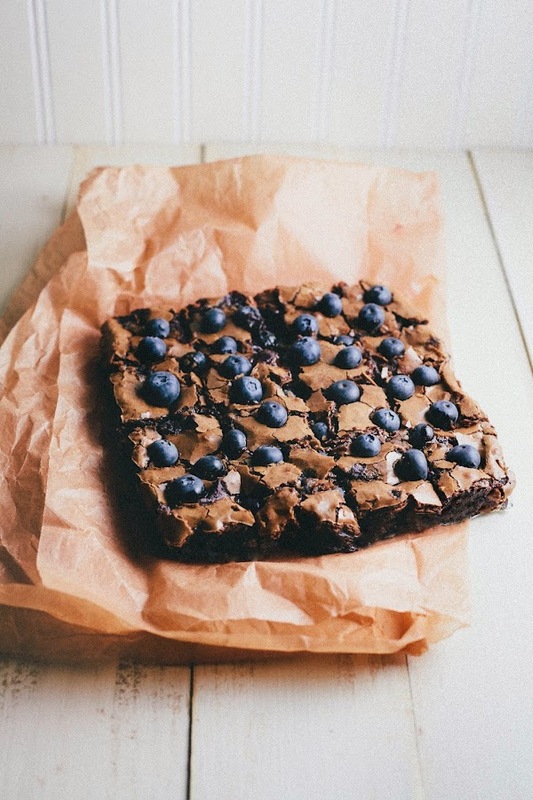 The blueberries are a wonderful addition to the fudgy brownies, giving the brownies' dense, fudgy chocolate flavor a fruity edge while maintaining the classic papery and crinkly brownie top. The first time I threw fruit into a recipe's batter, the fruit sank to the bottom and made the bottom of my baked good incredibly soggy. No bueno. 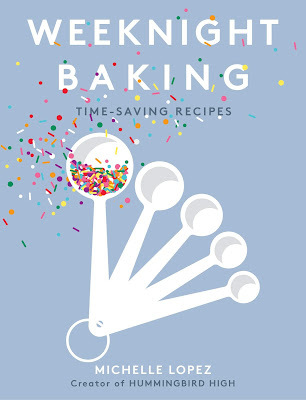 I've since learned the secret — toss the fruit in a tablespoon or two of flour, just enough to give them a light coating. The flour coat absorbs some of the liquid released by the fruit as it bakes and keeps the fruit in place until the crumb has set. A good rule of thumb is to use more flour for riper, juicier fruits and less for less juicy fruits. Be careful not to abuse this rule too much, or you'll end up with dense baked goods whose proportions are all off due to extra flour. Preheat the oven to 400 (F). Prepare an 8 by 8-inch baking pan by lining with parchment paper or foil, leaving an overhang over each end. In a double boiler (or, a heatproof bowl set over a pot of gently simmering water), combine 5 ounces finely chopped bittersweet chocolate and 6 tablespoons unsalted butter. Melt over medium-low heat, using a heatproof rubber spatula to stir occasionally until the mixture is melted and smooth. Once the chocolate and butter have completely melted, remove from heat and allow to cool slightly on a wire rack. In the bowl of a freestanding electric mixer fitted with a paddle attachment, combine 2 large eggs and 1 cup granulated sugar. Beat on medium-high speed until light and fluffy, about 5 minutes. Lower the speed to the mixer's lowest setting and add 1 teaspoon pure vanilla extract. Continue mixing on the lowest speed and slowly add the cooled melted butter and chocolate mixture (from the 2nd step) into the mixture, mixing until just combined and the batter is a uniform chocolate color. Once the batter is a uniform chocolate color, sprinkle 3/4 cup all-purpose flour and 1/2 teaspoon kosher salt over the surface of the batter. Use a rubber spatula to gently fold the flour into the chocolate batter — DO NOT OVERMIX. Overmixing will lead to dense, hard brownies and me crying tears of sadness. Simply fold until the ingredients are just combined — at this point, it's okay to have one or two flour streaks left in the mixture. In a separate medium bowl, toss together 1 cup fresh blueberries with the remaining 2 tablespoons all-purpose flour. Add the blueberry mixture into the brownie batter, using a rubber spatula to fold the fruit evenly into the batter. Again, be careful not to overmix! Transfer the batter into the prepared baking pan and bake in the preheated oven for 30 to 40 minutes, until the brownies are slightly puffed but still moist in the center. Transfer the pan to a wire rack and immediately press the remaining 1/2 cup of blueberries on to the top of the brownies. Be careful not to press too hard — a gentle tap will do. Allow the brownies to cool in their pan completely before cutting into squares. I have some fresh blueberries from a little local farm here in Nashville that have been waiting for juuuust this! Looks delicious. This sounds like such a great combination! 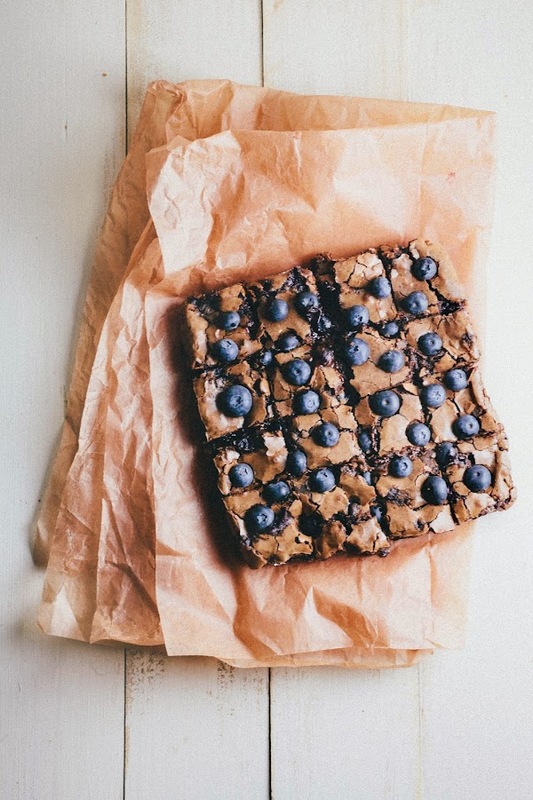 I've never been a fan of blueberries in muffin form, but in a big pan of chewy chocolate brownies? Yes. Love the fresh berries on top too! Beautiful! These look ooey and gooey - love it! 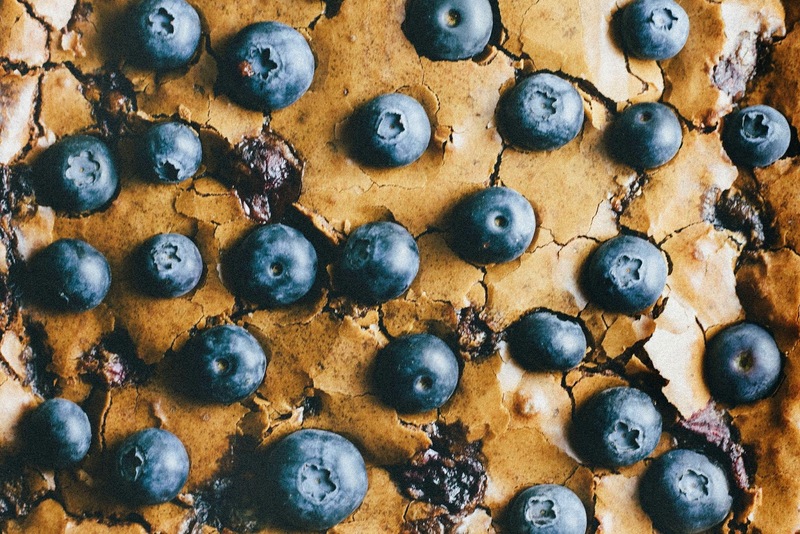 I love brownies and I love blueberries. They look great. Glad you didn't make us wait! These look amazing - I have made brownies with raspberries, but never with blueberries. Yum! these brownies look fantastic! that papery skin studded with those dusty blue beauties. i LOVE how you popped some raw ones at the end for contrast. i swoon. Um if these are your careless shots, I say don't even worry!! Post 'em all! Because I think you totally captured utter beauty in these ;) Funny--I was just thinking how I should build up a backlog for the upcoming month, but I can't even bring myself to do it! Probably a good thing, as my photos would be seeeriously ugly. Now I'm sad we put the rest of the blueberries we picked in the freezer because I want to make these for a party on Friday!! I don't know what you're talking about because your photos still look gorgeous as ever and you STILL have succeeded in me wanting brownies. I love fruit and chocolate, don't know why I never thought of this sooner! Ugh, I know that feeling about photos. That said, I think your "careless" photos are still a thousand times better than anything I could take and I think these brownies look totally amazing - that crinkly top totally kills me. I think your photos are so pretty but yes I feel your pain on being disappointed!! I have been loving blueberries lately - this sounds like a delicious combination! Do you think I could make these with cut-up strawberries? I have some really beautiful ones right now but I think they would be too large unless I cut them up, but I worry that would make them too wet. Maybe I could just increase the amount of flour that I dredge them in? Ooh, strawberries would work! But I think your instinct is right — I do think they would be too large, so be sure to cut them up and increase the amount of flour you dredge them in. Let me know how it works out! Frozen blueberries would work! In fact, I think frozen blueberries tend to hold better in this recipe. But yep, be sure to skip them up top. Thanks Michelle!! I made them Friday night and they were AMAZING!! Frozen blueberries totally worked. I dotted some on the top before they went in the oven and loved the little bit of juice escaping when I pulled the brownies out. I decreased the sugar by 1/4 cup for my preferences. Might try 1/3 cup less next time since I am trying to watch my sugar. Used whole wheat pastry flour too. Really great recipe that I will totally make it again! Your post and this one look eerily similar! http://www.ohladycakes.com/2014/05/double-chocolate-raspberry-brownies.html Either way, it's a delicious idea. Oh whoa! Great minds think alike. Raspberries and brownies would be good too! I guess her recipe is vegan though. Thanks for sharing! 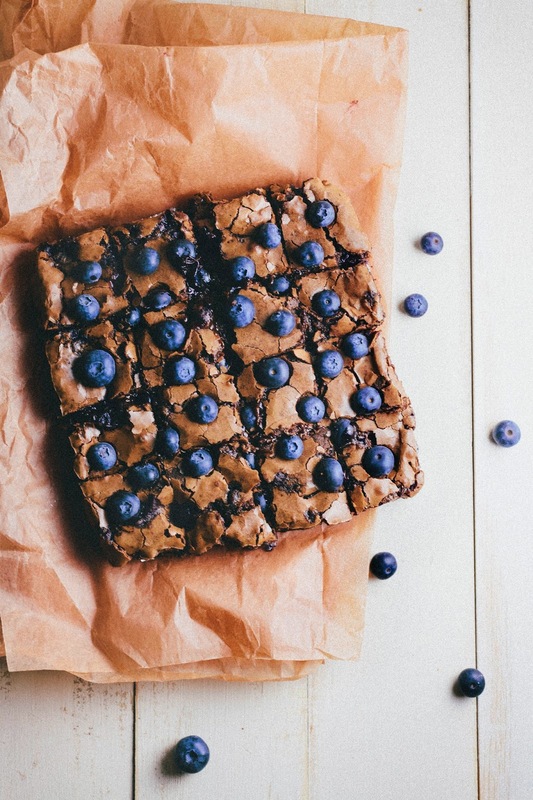 I would never think blueberries in brownies.. but those are stunning! Hi! Just found your blog while browsing and I'm loving it :) Stopped by this recipe to say that it looks delicious. I've also done chocolate cake with raspberry and blueberries not long ago and I really like this kind of recipe (with the hidden fruit! ).